On November 9, 1952, the Huntington Galleries opened in the Park Hills section of Huntington. It was West Virginia’s largest art museum. By the time the name of the galleries was changed to the Huntington Museum of Art in 1987, the collection had grown to more than 15,000 objects. 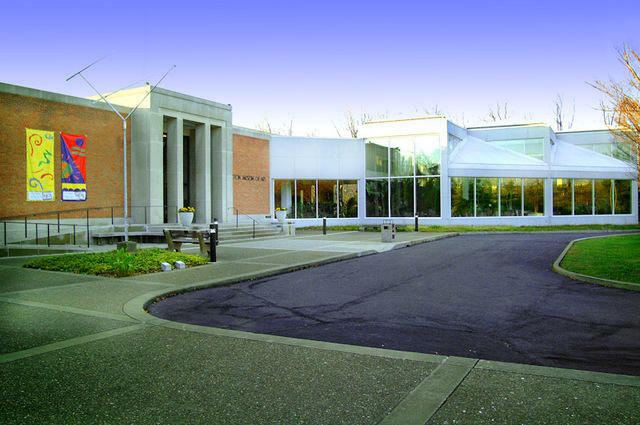 With close to 70,000 square feet of space, the museum hosts traveling exhibitions and has permanent galleries of British silver and portraits, antique firearms, Near East objects, and an Ohio Valley glass collection of more than 3,000 pieces. The museum’s Daywood Collection features such artists as Childe Hassam and Andrew Wyeth and contains fine examples of late 19th-century and early 20th-century American and European artwork. The museum houses a research library, an auditorium, and five art studios. Studios 1, 2, and 3 are named for renowned architect Walter Gropius. The studios and Doherty addition are the only museum designs by Gropius built in the United States. They were the last project of the aging architect. Located on more than 50 acres, the Huntington Museum of Art also includes two nature trails and a subtropical plant conservatory.